The Russian economy boomed in the period of rising energy prices. That period coincided roughly with the era of Vladimir Putin's presidency (2000-2008). The speed of Russia's catching-up was then even faster than that of the new EU member states from Central and Eastern Europe. Surging energy export revenues gave a boost to both private consumption and, later on, also to investment. Thanks to windfall gains from energy exports the government's external debts were paid back, foreign exchange reserves reached USD 600 billion as of mid-2008, and both the current account and the state budget were in a large surplus. However, the excessive dependence on energy has represented - together with adverse demographic developments and various institutional bottlenecks - a major challenge for the sustainability of Russian growth even in the medium and long run. Russian policy makers have been aware of these vulnerabilities and launched an ambitious economic modernization programme already in 2007. The programme aimed at the diversification of the economy and at fostering innovation with the help of industrial policy tools and public-private partnership schemes. There were serious doubts that these efforts would lead to the desired results, inter alia due to the high risk of abuse, inefficiency and other institutional bottlenecks prevailing in Russia. Nevertheless, before the outbreak of the global crisis, the medium-term growth outlook was generally positive, although a growth slowdown appeared inevitable already at that time. After September 2008, the global crisis hit Russia particularly hard; the main transmission channels were collapsing oil prices and sharply tightened credit conditions. The government responded quite early to the crisis with huge economic stimulation packages, supporting banks, large companies and also consumption. In spite of the anti-crisis measures, the GDP contracted by nearly 8% in 2009, largely a consequence of sharply reduced investment. However, recovery started already in late 2009 and may be rather robust - not least thanks to recovering energy prices. Among challenges facing Russia is the country's integration in the world economy, especially regarding accession to the WTO, and relations with the EU and with former allies in Central Europe and the former Soviet Union. 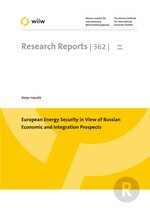 Despite large economic asymmetries between Russia and the EU (most evident in foreign trade, investments and economic size) and sometimes conflicting interests (in particular regarding the contest for influence on the post-Soviet space), the paper argues that mutual interdependence requires cooperative approaches that would serve best the interests of Russia, the EU and the countries in between. Russia is a major producer and exporter of energy, especially regarding natural gas. The EU is the biggest market for Russian energy exports. The current mutual dependency notwithstanding, both the EU and Russia undertake serious efforts at diversifying energy supply sources, building new transit gas pipeline routes and tapping alternative markets. Russia seems to be in a stronger position in the geopolitical game for controlling energy resources in the post-Soviet region, especially in the Caspian Basin and Central Asia: it has a common energy policy and strategy (in contrast to the EU) and possesses better knowledge and contacts to other energy producers in the region. In this way, and by exerting more control over the extraction and transit of energy from the region, Russia may also compensate for the exhaustion of domestic energy resources and can possibly counterbalance the declining indigenous energy production. Moreover, maintaining its energy export potential - which will remain crucial for Russian export revenues in the foreseeable future despite various diversification and modernization efforts - can also be facilitated by the mobilization of the still huge domestic energy efficiency potential. European energy imports from (or via) Russia can thus be maintained and probably even increased.